Dubai International Boat Show recorded its biggest sale of the event with a 40 metre Sunseeker superyacht fetching AED100 million. Exhibitors across the board reported good sales with smaller boats, mid-range and superyachts all selling well. “The Dubai International Boat Show is recognized globally as the leading event for the entire marine industry in the Middle East, and the sale of the spectacular Sunseeker superyacht is a prime example of the growing confidence in the leisuremarine market,” said Trixee Loh, an organiser of the event. Sunseeker were one of the five largest exhibitors at this year’s event which in the past has been an excellent sales channel for the company. 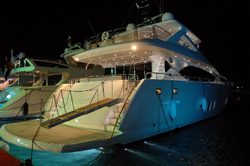 In the 2010 edition of the show, Sunseeker sold a 38 metre superyacht for AED 72million. More than 750 exhibitors, including 200 first timers, participated at the Dubai International Boat Show 2011, which was held at the Dubai International Marine Club – Mina Seyahi.